- Preheat your oven to 190 C degrees. - In a medium size saucepan bring water to a boil, put the spinach in, cover it and let it go for 2min. This will soften the spinach and make it more enjoyable. - Drain the spinach, rinse it under cold water and press it so you take all the moisture out. - In a bowl mix the spinach with the cheese crumbles, onion, salt and pepper. - Take a casserole dish, brush the bottom with olive oil and start layering the filo sheets at a different angle, brushing each one with olive oil. Make sure half of the sheet is in the dish and the other half is out. - Spoon the spinach mixture in the dish and once it's all in, take the filo parts that hang out of the dish and fold them on top of the mixture brushing each one with olive oil, as well. When the last piece of filo pastry is in, brush the whole pie with olive oil. 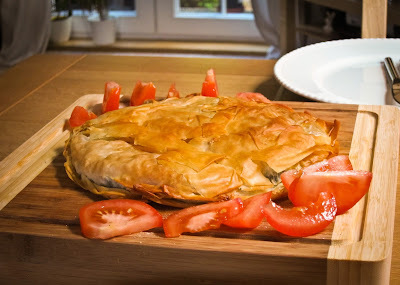 - Bake the pie for 30-35min and enjoy!